A renewable resource is an energy source that is regenerative or virtually inexhaustible. Renewable energy sources include solar, wind, biomass, waste, geothermal, and water (hydroelectric). Solar thermal technology converts solar energy into thermal energy, while solar photovoltaic converts solar energy into electrical energy. Wind turbines harness wind’s kinetic energy and convert it into electricity. Biomass energy is derived from hundreds of plant species, various agricultural and industrial residues, and processing wastes. It has become increasingly more common to utilize renewable resources in a distributed fashion. Unlike large utility scale generation sources, distributed generation uses smaller scale technologies to produce electricity close to the end users of power. In many instances, the distributed generation resource is customer, not utility, owned. When considering the connection of a distributed generation resource it is important to consider various aspects of the project. The District has available a Distributed Generation Interconnection Guide that will help the potential distributed generation operator with some of these aspects that are required in order to make the project successful. Completion of the District’s Application for Approval of Distributed Generation Interconnection is required prior to constructing an interconnection to the District’s distribution system. It is important to complete this document early in the process so that the District is aware of your intentions and can research the equipment you propose to connect. Equipment can be purchased and construction of the interconnection can begin once the Application has been completed and accepted by both parties. Prior to closing the interconnection switch once construction is complete, an inspection by both the State of Nebraska Electrical Division (NSED) and the District is required. The NSED should first be contacted by your electrician and upon notification to the District by NSED that your installation has passed NSED requirements, an inspection by the District will follow. Upon verification of the terms of the interconnection and equipment by the District, both parties will sign the Agreement for the Closed Transition Operation of Distributed Generation and the interconnection switch may be closed. A signed Agreement is the final step for interconnecting a customer owned distributed generation resource. Please be mindful that the installation, interconnection, and operation of a distributed generation resource without an Agreement signed by both parties shall be grounds for immediate disconnection of the District’s service without constituting a breach of contract. The District has approved Service Regulation 800-Parallel Operation of Customer’s Generating Equipment With District’s Service for the installation of distributed generation sources of 25 kW and below. Service Regulation 800 allows the customer to stay on their existing rate schedule. Pursuant to State Statue 70-2005, enacted in 2009, Norris Public Power District must publish an annual net metering report. Net metering is available to customers who install renewable fuel generators such as solar, wind, hydro or biomass sources and operate the generator in parallel with Norris Public Power District’s electrical system. 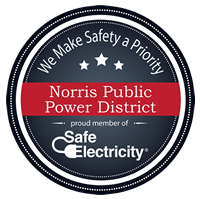 For any questions regarding distributed generation contact the Norris Public Power District Engineering Department at 1-800-858-4707.